When the $350-million Post Oak Hotel debuted in Houston, it set the new standard of luxury in a city known for high style. In fact, it’s the only property in the Bayou City to receive a Five Diamond distinction from AAA. Flying high above the glamorous Uptown and Galleria area, the 700,000-square foot tower embraces every aspect of extravagance with its cascading chandelier inspired by the Dubai Opera House, two-story Rolls-Royce showroom, and hotel room pillowcases monogrammed with each guests’ initials. Every touch has been meticulously planned in order to earn and retain the hotel’s coveted Five Diamond status. 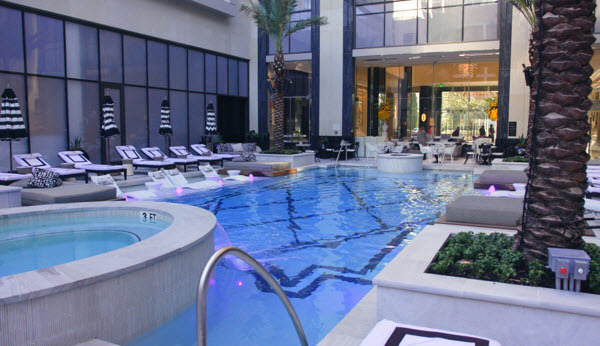 So when Post Oak Hotel needed a way to close off its poolside bar without compromising style, the hotel’s owners Landry’s, Inc. turned to the trusted Overhead Door™ brand. 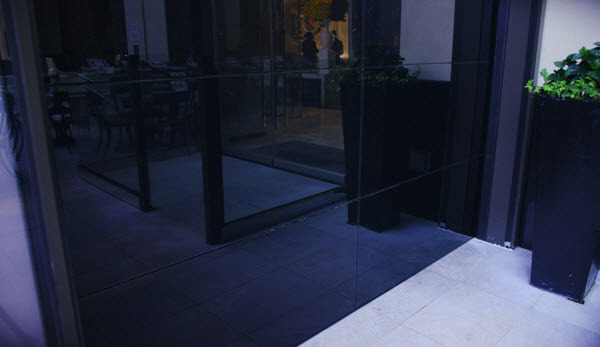 Receiving high praise from architects and designers, the brand’s all-glass garage door Envy™ was a natural fit for the hotel’s elite design. 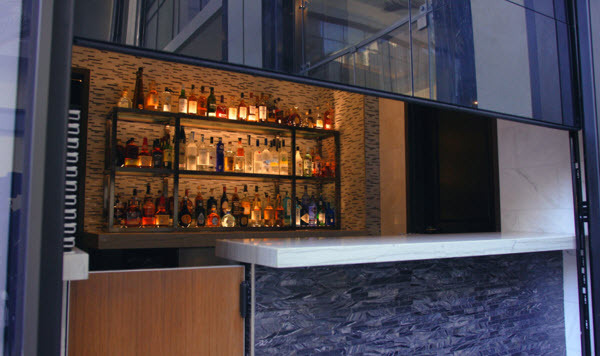 The opaque black glass mounted on top of an aluminum structure creates a glossy sheen, while completely hiding the cozy bar tucked in a back corner. 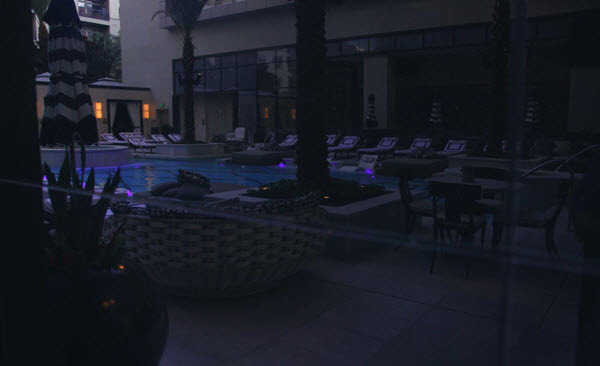 The reflective black glass creates a stunning backdrop against the sparkling pool, enhancing the posh ambiance. During open bar hours, the Envy™ garage door seamlessly rolls up to reveal a chic bar station where hotel guests can order a cocktail to enjoy by the pool. “Envy™ has the beauty of what we needed it to look like, and it’s got the functionality of what we needed it to do,” said Jeff Cantwell, Executive Vice President of Development of Landry’s, Inc., one of the leading dining, entertainment, gaming and hospitality groups. Not only does Envy™ perfectly complement the outdoor oasis, but it also provides peace of mind with its ¼” tempered glass. Envy™ Model 522 glass is extremely tough, but if broken, it will crumble into small granular chunks instead of splintering into jagged shards. 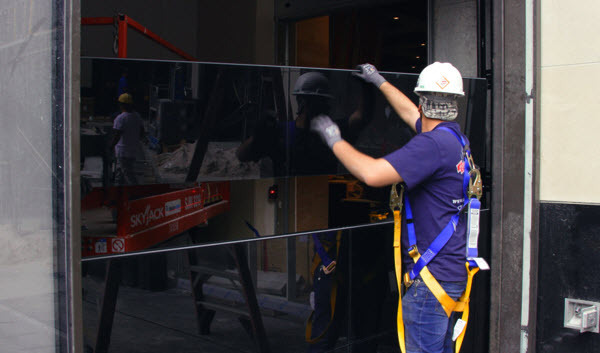 Additionally, a flexible vinyl bottom seal helps prevent glass breakage while providing a weather barrier against dirt and other elements. Landry’s is extremely happy with the ultra-modern look and functionality Envy™ provides. In fact, they have asked Overhead Door Company of Houston™ to install an additional Overhead Door™ Aluminum garage door on the property since the design amplifies the hotel’s overall sophisticated style. 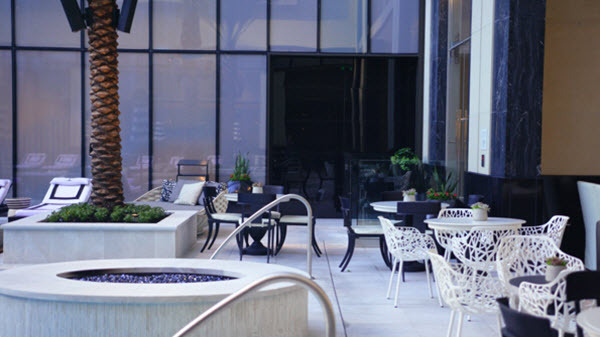 If you find yourself lucky enough to be lounging poolside at the Post Oak Hotel Uptown Houston, snap a picture and tag us on Instagram (@theoverheaddoor), Facebook (@OverheadDoor) or Twitter (@Overhead_Door) !